I laughed because for me the two were the same. “I’m not sure I understand your question,” I replied. That time brought me to the eventual recognition of how important it was for the congregants to know where I stood politically. So did I preach Jesus or the social gospel? I was reminded of this question — and of how politics can divide a church — while working on a story about two pastors in New York City who have strong connections to the church that baptized President Donald Trump. 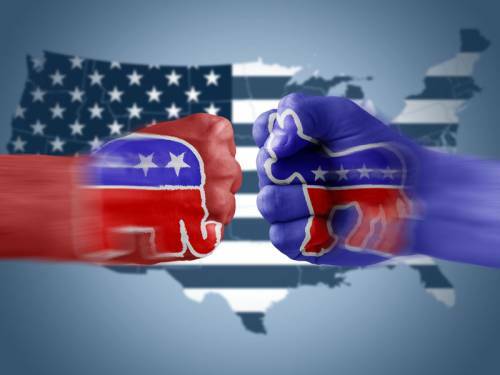 As one of the most divisive presidential elections was playing itself out last fall, the Rev. Patrick O’Connor at First Presbyterian Church in Jamaica — in the borough of Queens — began hearing stories about Trump’s Sunday school days from the church’s oldest member, 96-year-old Chris Ferro. Knowing this history, O’Connor reached out to the Rev. Dr. Scott Black Johnston of Fifth Avenue Presbyterian Church, who also had ties to First Jamaica Church. They began talking about what the church connections might mean. Black Johnston also grew up in First Jamaica Church and was baptized in the same font as our current president. Through the baptismal water sprinkled on their heads as children, they share the sign and seal of the covenant grace made by God through Jesus, extended to humanity. Now the church Black Johnston serves is only a minute away from Trump Tower. In fact, Trump could see the Fifth Avenue steeple beckoning in the distance through the family window. 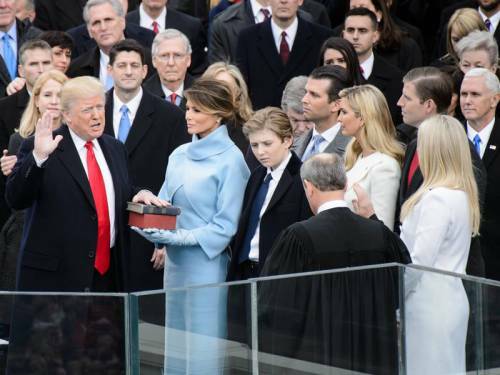 O’Connor and Black Johnston felt they had a responsibility to reach out to Trump, to let him know there are millions of Christians who belong to politically, economically and ethnically diverse congregations. They extended an invitation to pray with and for him. Two days before his inauguration Trump took them up on their offer. O’Connor said part of his motivation in meeting Trump was the hope that he might one day return to “the real Jamaica, New York” to hear stories of his immigrant mother and to see how racism, homelessness, immigration and lack of economic opportunity and health care are impacting the neighborhood O’Connor serves — which has growing Muslim and Latino populations. Black Johnston preached a sermon just days after he and O’Connor had prayed with Trump. In his message he told stories of 25 years in ministry, about the thousands of conversations he’d had with individuals, couples and families. Many were uplifting; others were depressing: People confessing of every sin in the book and a few that aren’t. Saying odd, destructive things, racist things. Spinning out vile theories about LGBT people. Saying malicious things about family members and former spouses. One man who lived next door to a church Black Johnston served put a check for $60,000 on his desk, saying he could do whatever he wanted with it, if he agreed not to house African-American refugees from Hurricane Katrina in the church. 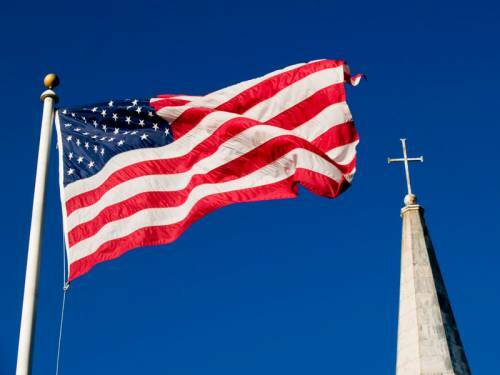 Polarization in America and the church has been part of an ongoing conversation at Princeton Theological Seminary, where 90 percent of the students live on campus and 40 percent are racial-ethnic. That day Barnes learned that race played a big part in determining the response. White students responded by saying they felt overwhelmed by the divides. While African-American students were disappointed, they were not surprised, saying they would preach prophetically as they always have. African-American students have been telling the wider Princeton community that they won’t get much further on dismantling racism if they’re the only ones talking about it — they need white allies to talk about how racism is at work in our society. To bridge the divide many pastors are sticking to the biblical text, preaching about Jesus, attempting to be prophetic, using the age-old stories. The Rev. Dr. Margaret Aymer, who immigrated to the U.S. from the British Caribbean, can attest to that phenomenon as associate professor of New Testament at Austin Presbyterian Theological Seminary. She says the message of Jesus is the same even in divided times. “We begin with Jesus as our savior and salvation,” said Aymer, “but the reason he is on the cross is because he is being prosecuted for being ‘king of the Jews’ — that epigraph was over his head.” It was a message that demonstrated what would happen to those who challenged the Romans and their elite powers. Aymer said the gospel critique of Roman Empire power is ever-present in the New Testament. The commentary on power is revealed in ways we might not always recognize or think about, she said. She said the call to preach Jesus is the same today as it was when President Obama was using covert drone strikes against al-Qaida, the Taliban and other groups the government considers at to be war with the U.S. President Obama ordered 10 times more drone strikes than his predecessor, President George W. Bush. While Aymer emphasizes the power of the biblical stories, Princeton Seminary students opted to encounter the gospel through lived stories. The Princeton community decided to sponsor a Syrian refugee family, housing the family in one of the faculty homes so they could be part of the residential campus community. Many seminary students graduate to a world — and even to churches — that are fractured, but the joy found through new relationships like this one in their community gives them hope. Barnes said it’s an attempt to make the local community reflect God’s values. “We want to look a bit more like that beloved community, which runs through narrative of Scripture,” he said. In his “Serenity Now” sermon at Fifth Avenue, Black Johnston pointed out that “dozens of distinct stories in Scripture” describe interactions between people of faith and those in political power: Moses delivering God’s command to Pharaoh, “Let my people go.” Nathan tricking King David into convicting himself for adultery and murder. Esther saving all the Jews in Persia from extermination. Jeremiah walking through the streets of Jerusalem with a wooden yoke symbolizing oppression. John the Baptist being beheaded for fiery sermons critical of King Herod. Jesus talking truth with Pontius Pilate, before the Roman governor tortures him. “Which of these [stories] represents the right way to be faithful and political? Is there one holy approach? Many?” Black Johnston asked. These lingering questions suggest there is nothing easy about the call of discipleship, of picking up one’s cross and following Jesus, in a time of polarization and fear. One of the foundational principles in the PC(USA) Book of Order is unity in diversity. In it we recognize that God brings together people of different races, ethnicities, ages, genders, abilities and theological convictions. Sometimes they sit right next to each other in church. These are the purple churches, mixtures of conservatives and progressives who gather to worship each week. Individuals and churches across the denomination seek to be faithful to the gospel. But they don’t always agree on the best way to do it. Christ calls people from the right and left, the North and South, the Republican Party and the Democratic Party to be his community. 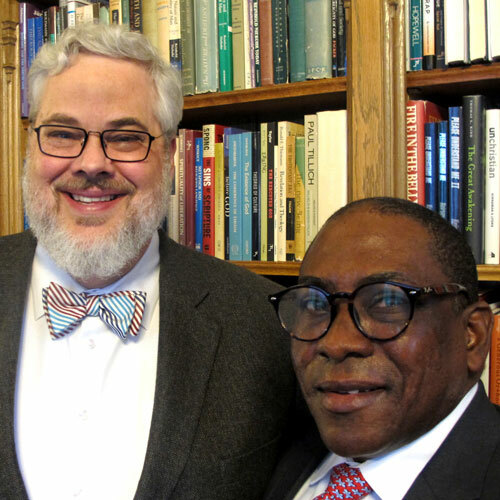 Princeton Theological Seminary’s president, the Rev. Dr. Craig Barnes, says that the church is not defined by culture or its boundaries, but by its center — Jesus Christ. He adds that agreement isn’t always necessary for a church to be faithful. Nor is any political agenda at the center. In many churches, Republicans and Democrats are baptized in the same font and eat at the same Communion table. They worship the same Christ and share the love of God even when they don’t agree. “We can have diverse and even conflicting convictions about politics and the best way to pursue social justice,” Barnes said. But those differences shouldn’t be more important than Jesus.